If the coin lands on heads – both teams send down the pulse to the end of the line and tries to be the first to grab the chicken. Whole groups stands in a circle – close enough to touch hands. Everyone puts left hand out and open (palm up). Right hand with finger resting above neighbor’s left open palm. On the count of three, try to catch your neighbor’s finger, while trying to avoid being caught by your neighbor. This is an everyone is it game. You are trying to tag other people and they are trying to tag you. However, people are split into smaller groups of three or four and each group is given a different color ball. Now, if a person is tagged they take a knee and can only get back in if someone from their team throws them their team ball. Coil-up a looped rope (ends tied together) and place it in the center of the group. Ask participants to reach across the coil of rope and grab a section of rope with one hand. Once this is done, ask folks to reach across and grab another section of rope with their other hand. When participants have a hold of the rope with both hands they shouldn’t let go. The object is for the group to untangle the rope. Participants can slide their hands along the rope but may not let go. Participants stand in a circle and link hands with a hula-hoop around a designated set link hands to start. The group must then pass the hula-hoop around the circle by passing it over and under their bodies and arms, without letting go of each other’s hands. An added challenge is to add a second hoop traveling in the opposite direction. With the group standing in a circle and each person holding a rope (ends tied together) the teacher will start a stopwatch and time how long the knot in the rope can be passed around the circle and back to the starting spot. 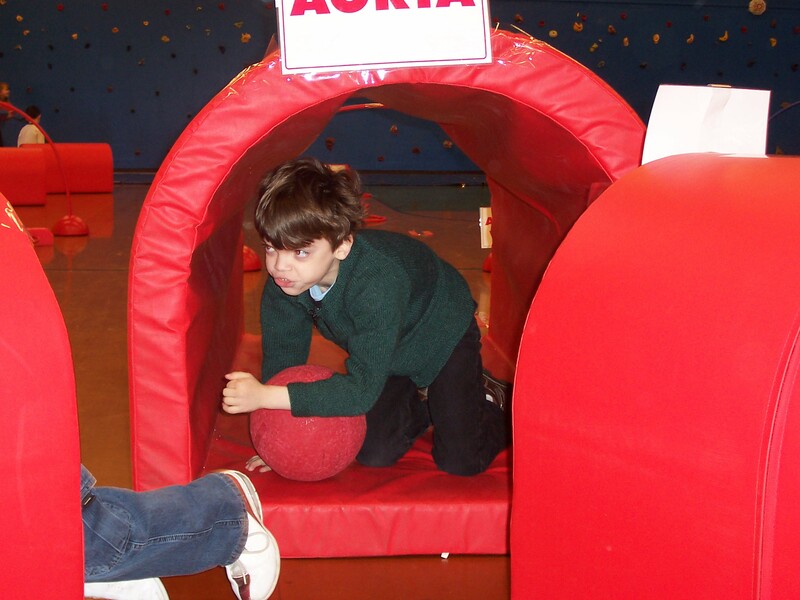 This is a fantastic journey designed so students can physically move through the four chambers of the hear in a larger than life setting.The gym is set up with the Heart Adventure Challenge Course from US Games. This giant replica of the heart travels from school to school in District 4J. A model of the circulatory system, set up in the gym, enables students to evaluate their physical fitness and learn the structure of the circulatory system. This course is an integrated unit designed to instruct students on the design and functions of the circulatory system (including the heart, brain, and lungs) by taking them through the system in a larger-than-life setting. Tied into this program are activities that integrate and correlate lifestyle concepts for each individual. In addition, students learn critical thinking, problem-solving, and cooperative living skills – skills necessary not only for successful completion of the challenge course, but also for success in life. The fitness unit encompasses all aspects of physical fitness, including eye/hand coordination, joint mobility, and movement and exercise of all muscles. The intriguing, colorful course is non-competitive, nonthreatening, and individualized. It is also accessible to students with disabilities. Minor modifications need to be made for different age groups (such as lowering the hoops for younger children). Even young children can learn the basic concept that blood flows in one direction and cannot flow back on itself. The basic concepts of the circulatory system can be expanded for older students. The course is based on a human model of the circulatory system, using only the right lung to circulate through. The activities enable students to evaluate their physical fitness and learn the structure of the circulatory system. The students are walking, jogging, running and moving on our gym scooters while navigating the blood’s pathway as it begins it journey from the right side of the heart to the lungs in search of oxygen and then re-enters the left side of the heart and is pumped to other parts of the body. This is a one-way system and a a never-ending process. Students will have the opportunity to repeat the course many times. The equipment has been chosen to aid in identifying the two separate sides of the heart. The right side of the heart is coded BLUE to indicate that the blood on this side is de-oxygenated (blood lacking oxygen). They carry a blue ball when they are moving on the side of the heart that is not carrying oxygen. Blood that enters through the pulmonary vein and moves into the left atrium is oxygentated and coded RED. The students carry a red ball when they are moving on the part of the heart that has oxygenated blood (left side). The right side (Blue) of the heart pumps blood to the lungs where blood takes on Oxygen and loses carbon doxide. Blood returns to the left side (Red) of the heart and then is pumped to all the other parts of the body. In a typical gym class, divide students into four Color Teams (Red, Blue, Yellow, Green) that will sit in relay style to begin class. There are three pathways for the students to travel on. One third of the class (blue team and half of the yellow team) starts on the “blue half” of the course – they travel on a scooter and carry a blue ball around and through various parts of the heart. The final third of the class (green team) travel around the gym dribbling a basketball around the exterior path that is located along the outer edges of the walls. This simulates blood flowing to all other parts of the body. Right Side Blue… Left Side Red..Go with the Flow! – Basketball Dribble (Note: the blue pathway is very popular because of the scooters and propelling yourself with a rope). Students complete the course as many times as they can during a class period. No passing others while on a heart pathway. You may move ahead of people only at the transition between pathways. If students are reckless because they are trying to get ahead of their classmates, they will be asked to go to a different pathway. Put your hand on your heart. Did you place your hand on the left side of your chest? Many people do, but the heart is actually located almost in the center of the chest, between the lungs. It’s tipped slightly so that a part of it sticks out and taps against the left side of the chest, which is what makes it seem as though it is located there. Hold out your hand and make a fist. If you’re a kid, your heart is about the same size as your fist, and if you’re an adult, it’s about the same size as two fists. Give a tennis ball a good, hard squeeze. You’re using about the same amount of force your heart uses to pump blood out to the body. Even at rest, the muscles of the heart work hard–twice as hard as the leg muscles of a person sprinting. Feel your pulse by placing two fingers at pulse points on your neck or wrists. The pulse you feel is blood stopping and starting as it moves through your arteries. As a kid, your resting pulse might range from 90 to 120 beats per minute. As an adult, your pulse rate slows to an average of 72 beats per minute. The aorta, the largest artery in the body, is almost the diameter of a garden hose. Capillaries, on the other hand, are so small that it takes ten of them to equal the thickness of a human hair. Your body has about 5.6 liters (6 quarts) of blood. This 5.6 liters of blood circulates through the body three times every minute. In one day, the blood travels a total of 19,000 km (12,000 miles)–that’s four times the distance across the US from coast to coast. The heart pumps about 1 million barrels of blood during an average lifetime–that’s enough to fill more than 3 super tankers. lub-DUB, lub-DUB, lub-DUB. Sound familiar? If you listen to your heart beat, you’ll hear two sounds. These “lub” and “DUB” sounds are made by the heart valves as they open and close.